Guts & Glory Tennis Catalog > Über Strings > WeissCANNON > WeissCANNON Sets > WeissCANNON Explosiv! "WeissCANNON Explosiv! Take it to the courts...You'll have a blast!" Siegfried Weiss, owner and founder of WeissCANNON, has already used his engineering background in fibers technology to create the most technologically advanced and best playing poly based string currently on the market. (WeissCANNON Silverstring) For an encore, he has now taken his engineering experiences and created what is arguably the finest performing multifilament string produced to date. Guts and Glory Tennis is absolutely delighted to introduce this new, ultimate performance string to the USA. Construction: The core of this premium multi is comprised of over 1200 ultra thin, high-elastic twisted fibers. The special resin coating is unique and new. It is a proprietary mixture consisting of molybden, resins, and other nano additives. Not polyurethane based like many others currently on the market. Advantage: A soft-playing multi with phenomenal tension maintenance properties. The Explosiv! is a tension maintenance champion leading to performance that can not be matched by any multifilament currently in existence. Note: The string is highly elastic and when tensioned it provides the level of performance of a thinner gauge string with durability that surpasses other premium multifilaments. Why we carry this string: Because it is by far the best performing multifilament string we have ever played. It is both fantastic and magical...thus we describe it as FANTASTICAL! Extremely comfortable and arm-friendly, holds tension and playing properties beyond reasonable expectation. In our initial playtest, after 30 days and 15 hours of playing time, the string had lost a total of just 13% which is what most competitors lose overnight! The color is no coincidence since this string plays buttery soft at net. We won't be undersold on any WeissCANNON, or MSV product. If you find a lower price from an authorized seller just contact us with the source and we will match or beat the price. If you find a lower price from an unauthorized source, such as ebay, contact us and we will try to match it or beat it. 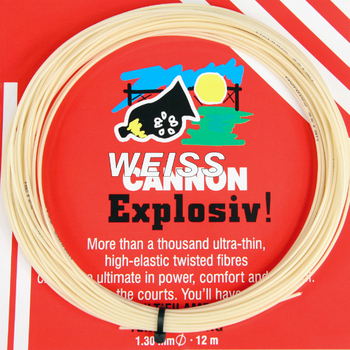 Guts and Glory Tennis is proud to be the first official US vendor for the WeissCANNON string products. Siegfried Weiss the owner and lead researcher of WeissCANNON is at it again. Not satisfied with creating the top performing poly-based strings in existence, he has used his knowledge, experience and advanced engineering degree to create a new premium multifilament string that clearly has the potential to change the landscape for premium synthetic strings by setting unusually high performance standards. This premium string will literally blow the socks off both you and your opponents. The incredible comfort is just one of many impressive features. Users will find a feathery touch at net and an unmistakably unique feel from all areas of the court. Power on demand with excellent control. German playtesters have raved that this string outperforms all others, including natural gut. CONSTRUCTION: The core of this premium multi is comprised of over 1200 ultra thin, high-elastic twisted fibers. The special resin coating is unique and new. It is a proprietary mixture consisting of molybden, resins, and other nano additives. Not polyurethane based like many other multis currently on the market. ADVANTAGE: A multifilament string that offers premium performance from all areas of the court and holds its playing properties well beyond any reasonable expectation. Excellent durability and minimal string movement. COMMENTS: Because of the comfort and ability to hold playing properties for an extended period of time, this string is an excellent option from those prone to tennis elbow or those who use lighter weight racquets and are looking to prevent arm pain. For those seeking a string that will offer playability that has been described as superior to natural gut, this is a lower-cost option to consider. The manufacturer recommends that this string be strung at 10% higher than normal. Testers report the string is lower powered at higher tensions, but also performs great at low tensions as well. The color is no coincidence as this string plays buttery soft. Some have expressed a desire for the Explosiv! to be made available in a thinner diameter. The reason this string is not available in a 17ga version is because of the high elasticity. When tensioned this string measures at approximately 1.18mm which is the equivalent to the tensioned diameter or less than many of the competing multifilament string products. TENSION: Using an ERT 700 we took the following tension measurements of the Explosiv! in a Kneissl Black Star which also collected on court playing time during the measurement period. For comparison purposes, please note that many current multifilament strings routinely lose 10 - 16% tension within the first 24 hours and much more after that period. Why not conduct a personal playtest today? We have tried to make it easy by allowing you to place a set or more in your shopping cart directly from the left column of this page. Please follow the WeissCANNON Explosiv! 660' Reel link if you prefer to save money by ordering in larger amounts.